Latex sound insulation has been developed as an economical, relatively easy and quick to apply product to help reduce exterior noise pollution whilst also providing additional thermal insulation to the surface. 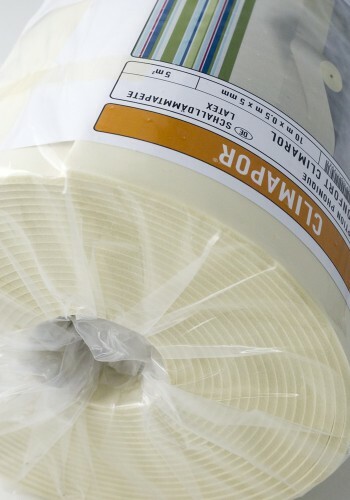 The product is provided with a bonded lining paper to aid further decoration. Please note this is a relatively low cost sound insulation product and the control of noise pollution is a complex subject so we cannot guarantee satisfactory results. For comprehensive information we recommend that advice from a specialist consultant is sought. This a Saarpor product from Erfurt MAV. Apply smooth side to the wall.